In this first edition of Fest en Fest, curators Hanna Gillgren and Heidi Rustgaard establish a benchmark for their festival in works with a rigorous choreographic approach to language. Karen Røise Kielland used it in A Slow Escape to compress a vast geographical journey on to a small stage, while Mette Edvardsen uses its negation in No Title to extrapolate the space of a small stage into the vast landscape of imagination. 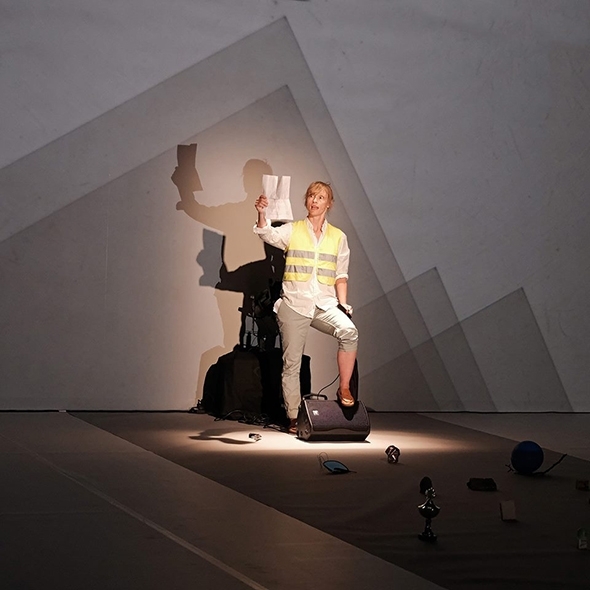 At her last appearance in London, at the 2012 Dance Umbrella, Edvardsen presented a project called Time has fallen asleep in the afternoon sunshine, where she gathered a group of like-minded dancers to each commit a book to memory in the same way that dancers memorize a sequence of steps. The performance was in reading the story or poetry from memory to an audience of one (at a time) in a public library. No Title’s approach to language requires a similar closeness and concentration between performer and audience but Edvardsen’s craft has evolved around her own authorship and an expanded sense of theatrical space. No Title (2014) is part of a trilogy of works with Black (2011) and We to be (2015) that explore the notions of appearance and disappearance through language. As Edvardsen observes in an interview with Eva Decaesstecker, ‘When I was making Black I thought it was the end of something, that I had closed a circle. I painted all my objects (from previous pieces) black in order to make them disappear, and with this removal of objects came language.’ In Black Edvardsen used language to make the objects reappear, whereas in No Title she uses negation in language to suggest disappearance. ‘The beginning is gone. The space is empty,’ she starts. When a word is invoked its sound signifies a reality with which it is associated; both the sound of the word (the signifier) and its reality (the signified) pass through our brain to corroborate the signification. But when the negation of a word is invoked, the signification is short-circuited; it becomes a space. As Edvardsen continues her series of verbal negations she creates a space on stage that represents the full potential of what has nominally disappeared. At the same time she constantly reminds us of the irreducible presence of the speaker — ‘Me not gone’, as she says — amongst what has disappeared or fallen away. The role of the choreographer in such an approach to choreographic writing that makes the signification of words a key element is to divest the creative language of any extraneous meaning. With a minimum of means Edvardsen eloquently demonstrates this to the point that No Title reveals the stage as a vibrant space from which all associative clutter has been removed. It is a lesson for any choreographer who takes space for granted as a container to fill with movement. Edvardsen’s voice does not simply pronounce words but expresses its own muscular quality — ‘le grain de la voix’ in Roland Barthes’ terms — and she gives it even more power by sticking paper eyes over her closed eyelids. Blindness is the negation of sight, so the phenomenon of performing without seeing underlines the idea of extracting reality from the influence of words. Using her body to see, Edvardsen senses the physical limits of the space she is making either through touch or the sensation of proximity. At one point she traces in chalk a line on the ground from the back of the stage to the front, a feathery, uncertain line from source to completion. Putting aside the chalk she works her way back upstage making the motions of erasing the line with her hand but in her blindness misses it. ‘Line is gone’ she says, setting up a slippage between verbal negation and the physical attempt to achieve it. Dance is often referred to as ephemeral but that doesn’t alter its ability to lodge itself in the emotional core of our being; while Edvardsen erases the appearances of her craft she never discards the core reality she signifies in her performance. As a writer of choreography she has created a work through its disappearance — even the title has gone — and at the end, as author, she also disappears. The stage we are left to ponder is far from empty; it resounds with the echoes of Edvardsen’s words and gestures and the chalk line is still there with the two paper eyes stuck to the proscenium. Even after she has left she remains pointing to her own withdrawal.